Some poetry begs to be understood; some challenges the reader to understand. Then there’s the poetry that doesn’t ask us for anything; it seems complete in itself, regardless of what we understand. 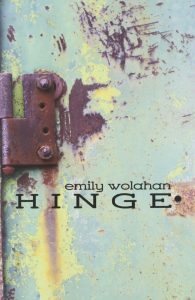 In general, Emily Wolahan’s Hinge fits into the latter category. Understanding is an open question and an important one, recurring throughout the book, but Wolahan knows better than to make things clear when they aren’t. Her poems aren’t the prosaic kind that tell vivid stories or create defined characters; even the images can be elusive, and moments of jumbled grammar can leave the reader stumbling. Sure enough, when I think of the book a few weeks after reading, I think of fog: the fog in the first poem, which hangs over a shore where the mother of a frustrated, inarticulate child might walk into the water and drown herself to be rid of her own inarticulate frustrations. Many of these poems take place somewhere along the water, and by the time I reached the penultimate selection, “Sheerness as Seen From the Nore,” I felt like the poet’s artistic mission was summed up in the lines, “We are filled upon acquaintance / with light as it is acquainted with water / ship, bird, land.” As Wolahan goes to ask her questions in the liminal space between sea and land, so she invites us to stand there with her, even if there are no answers. Thus she begins the poem, “Instead, water laps a low wall. // A dock crane’s long yellow arm / dipping slowly, / it’s afterimage arresting the sun.” And so we watch, arrested, too, but not pretending to know what there might have been in place of this scene, what any of us might have had instead. a complex of mills producing. That distant dissipating wisp of smoke. The dank purple of broken-up soil. Each destroying the other’s appetite. Wolahan’s poems call for immersion more than plain understanding, and I think it’s no coincidence that I felt my way through them more easily while soaking in a bath. Her work rewards rereading, as it feels much rewritten, with all the extra words revised away. Her language may be simple, but it’s surrounded by all of the empty space of real uncertainty. What might fill all of that space, what might connect the images, the statements, the unexpectedly adjacent words, is left to us to imagine—or not, if feeling is enough. Libby Maxey has a Masters degree in Medieval Studies and works as a freelance editor. She is part of the staff at the online journal Literary Mama, which has also published her poetry. Other work has appeared in Mom Egg Review, Brain of Forgetting and Off the Coast. Previous ArticleThe Best Small Fictions 2015, Tara L. Masih and Robert Olen Butler, Eds.